As most of my readers know by now, I greatly enjoyed Rules of Civility by Amor Towles (You can see my review here). Towles finds that magical balance between bright, vibrant characters and poignant, basely human moments. Eve in Hollywood is a novella, written exclusively for e-publication, that picks up where we left off with Evelyn Ross. She boards a train from New York and at the outset of this extension we are traveling with her. Eve’s insights are, as usual, amazing. So too is her ability to “go with the flow.” I suppose I find her all the more fascinating because that is a talent I lack — I need a plan, and I have to stick to it. On the spur of the moment, Eve decides not to get off the train in Chicago, but instead ride all the way to the City of Angels. Her brief adventures there are a reminder why we should all occasionally go where the wind takes us, and enjoy the ride along the way. Here are some of my favorite passages. Because this is only an e-book there are no page numbers. I have noted the LOC number for your reference, however. Some of the most touching scenes are when Eve meets Olivia De Havilland, not yet a household name. The two enjoy a night on the town, ignoring the studio’s strict rules for their up and coming star. It would be so easy for this cameo appearance to seem forced or trite. Instead it blends seamlessly and serves as a perfect foil for Evelyn. I very highly recommend this brief book (and it’s only $2.99). It is not at all necessary to have read Rules of Civility, though I suggest you do! Many thanks to Shannon at Penguin for an e-galley to read and review. Oh how I wish this wasn’t an e-book only edition! I only have an eReader for work and can’t buy anything on it. Drat. This sounds amazing and your review reminds me that I still have to read my copy of Rules of Civility! I brought it with me on my honeymoon last year but didn’t have time to get to it. BTW – I think I might give the Charlie Chan novels another try. I just bought #2 from B&N and am looking forward to starting it soon. I agree — I also wish it were available in “paper” form. Perhaps someday. Could you borrow via a library service? 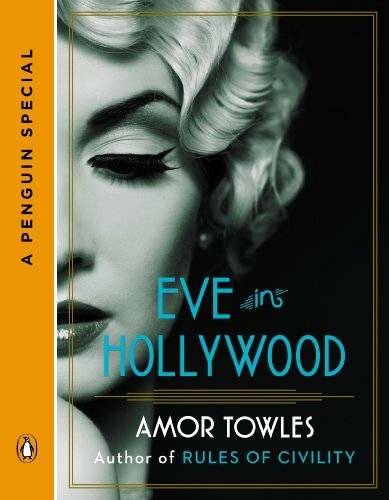 Hello – I don’t own an e-reader either, but I was able to download Kindle’s app to my regular computer so that I could order and read EVE IN HOLLYWOOD. It is free to download – you just to pay for the e-book.